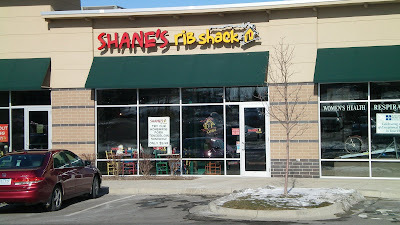 Shane's Rib Shack is a chain of BBQ restaurants founded in Georgia, each has a photo of their smiling fat guy founder, Shane, posted inside. 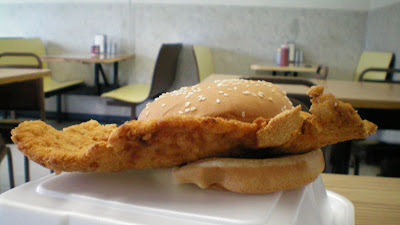 I was quite surprised to see their window advertising homemade tenderloins while driving through Clive, so I decided to stop in and give it a try. Location: 12695 University Ave. in Clive, Iowa. Directions: Take University Ave in West Des Moines to the intersection with Granite City and Biaggi's, look for this place in the strip mall behind Walgreen's. 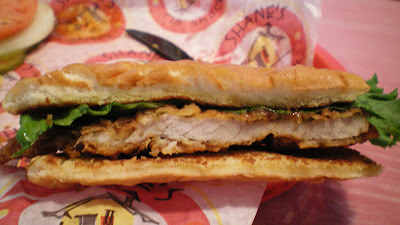 The Tenderloin: This was something new. 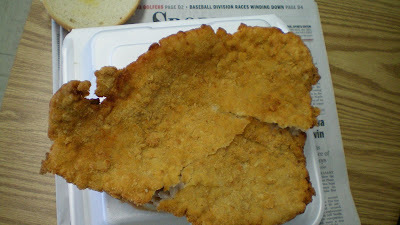 The bright white cut of pork was not tenderized at all, just cut across the grain. It was tough to bite into at first, but fell apart with chewing. The thin cut of pork was floppy when lifted off the food basket, with the meat was thinnest at the center. 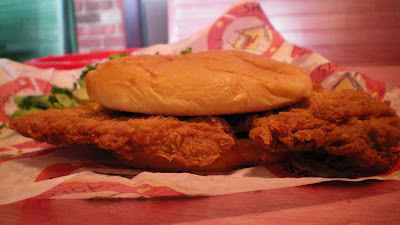 Breading was lightly seasoned southern-fried chicken tasting crunchiness. The selection of BBQ sauces to top the sandwich were a plus. 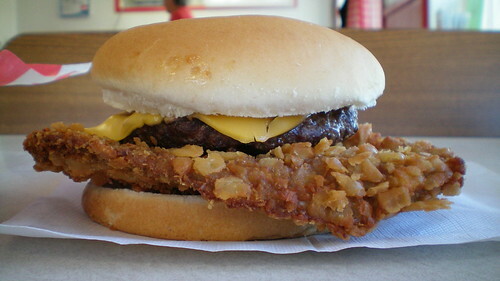 Served on a toasted bun with all the fixings 6.7 out of ten. Also on the menu: Southern style BBQ favorites like Chopped Pork, Beef Brisket, and Ribs, sides including a thick stew and fried okra. Service: Counter service with food brought to your table. Ambiance: Over-done decorations for someplace in the suburbs. Tables and booths to sit and watch sports on TV. A bright multi-colored interior with BBQ shack decorations. Final Thoughts: I am encouraged by this menu addition by the local franchise of a Southern BBQ chain. In order to make the tenderloin better, they need to tenderize it first. 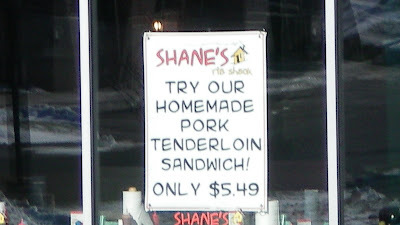 Its a good option in the tenderloin desert that exists in the suburbs of any big city in Iowa. Van Buren County is known for its old-fashioned small town lifestyle without the modern life amenities of electric stoplights or fast food. The small towns are charming and unspoilt. 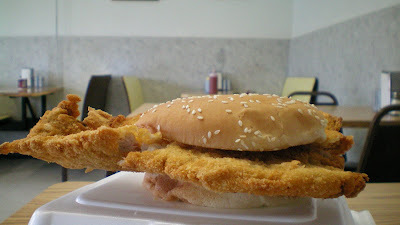 Along the main street of Keosauqua just north of the Des Moines River is a small ice-cream shop with a selection of sandwiches including a homemade tenderloin. Location: 106 Main St. in Keosauqua Iowa, (population 1,066) the seat of Van Buren County in Southeast Iowa. At least 2 hours drive from anywhere busy or important. Well outside cell-phone range. Directions: Take the only road leading into town, State Highway 1, just north of the river. 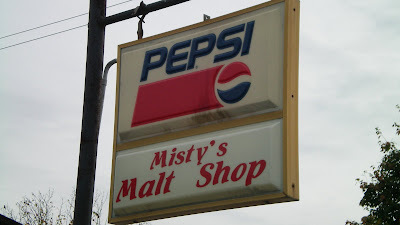 The Malt Shop is the second building on the east side of Main Street. Also on the Menu: A full selection of Ice Cream choices, homemade chips, other fried stuff and breakfast in the mornings. Service: Counter service inside with a window for people to order from outside. 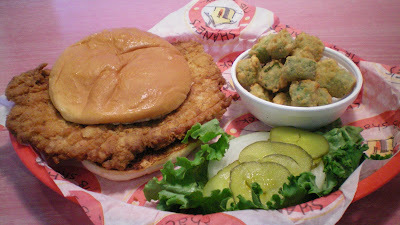 The tenderloin took about five minute to fix. Ambiance: Brightly lit interior with tables and booths for seats. Windows were heavily decorated for High School Homecoming Week during my visit. There is a mural of a cow painted on the front of the building. Final Thoughts: Van Buren County is one of the nicest parts of Iowa that few people ever visit. Its food scene is mostly untainted by the commercial fast food and pizza chains that take up so much space in town squares across the state. 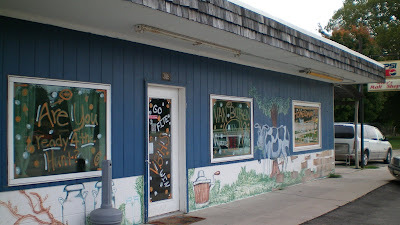 This small ice-cream shop is just a part of the great places in Van Buren County.